Today is special because my guest is a member of my Picture Book Critique Group—the Pens and Brushes. As the name indicates, the group is made up of both writers and artists. 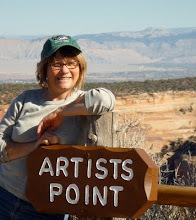 Diane Kress Hower is adept at both writing and illustrating and especially photography. When Diane is not writing/illustrating or supporting others in her private practice, she volunteers as the Local Area Coordinator for the West Slope, Rocky Mountain Chapter of the Society of Children’s Book Writers and Illustrators, and as a Commissioner on the City of Grand Junction, Commission on Arts And Culture. Hi Diane, Welcome to Stories a la Mode. I’m happy to introduce you to my other critique group members, fellow Angels and Musers, and relatives. Those are beautiful and impressive mountains behind you in this picture, Diane. You are understandably proud of them. Diane, please share with us the way in which you became Passionate about Picture Books. I was put under a spell by picture books a very long time ago and the spell has never been broken. I found myself absorbed in the art and text. There was a time where I would choose a book by the art. Then when I was an elementary school counselor, I used literature, mainly picture books, in most of my classroom guidance lessons. I worked in rural schools with many second language learners. The pictures were often essential in my teaching concepts with children from different cultural backgrounds. Whether I was in a kindergarten class or sixth grade, everyone loved the read-a-loud picture book. I absolutely love reading picture books out-loud. Since my husband will most likely not read this post, I will share that when we were dating, I asked him to sit and listen to me read through my favorite stack of picture books and then tell him why the book was so important to me. He did not bat an eye or complain, so he passed the test! When you are writing a pb manuscript, what area of the story do you get the most satisfaction in developing and exploring? I love the idea that comes to me from what seems to be thin air. I like playing with the idea and the main character. A part of that is naming the character and is essential as it gives depth and life to him or her which then expands into the story. What part of the story do you find the most frustrating or difficult to develop and why? This is a tough question because I really love to write and am a perfectionist. I think the “perfect” beginning and the “perfect” ending to a story are difficult to develop. Your first sentence either hooks the reader or not, and you can have an idea of what you want to happen at the end, but the last page has to bring the story full circle and have an “ahhh” to please me. I actually like the challenge. Diane, if you could choose one pb author, author/illustrator, or illustrator to spend a day with, who would that be and what would you want to receive from your time with them? This is hard to narrow down as I have so many illustrators and authors that I admire for very different reasons. If it had to be just one, I would choose David Wiesner. I love his books. My favorite is FLOTSAM. His images are dynamic and move the story through with tightly crafted design elements. His ability to pace the story with the use of scale, point of view, imagination and humor is absolutely masterful. I would want to pick his brain and understand where his ideas and creativity comes from. Finally, what was your favorite picture book as a child. And is it still on your list of favorites? My favorite picture/story book was the Little Golden Book, The Bremen Town Musicians. I have always been very fond of animals, particularly dogs and horses. I enjoyed how the animals joined in the group and worked together and found happiness. I was bullied a lot so I appreciated them “getting” the robbers, and I grew up in a musical family. My second favorite sort – of- picture book was an early reader by one of my favorites P.D. Eastman, Go, Dogs, Go. There is nothing better than a dog party. Tire of dogs? Never. Ever. Dog Tired. On that blog you will find interviews of other picture book writers who discuss their Passion for Picture Books. Diane, it has been a pleasure having you on the blog today. Thanks for coming and please come back.